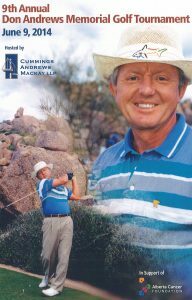 We are 10 days away from the 9th Annual Don Andrews Memorial Golf Tournament in support of the Cross Cancer Institute and the Alberta Cancer Foundation. Over the past 9 years we have raised over $300,000 for the Alberta Cancer Foundation to honour our fallen partner, Don Andrews. The tournament is at the fantastic Edmonton Golf & Country Club on June 9, 2014. We are almost sold out so don’t miss your chance to golf at one of the best courses around Edmonton and support a worthy cause.